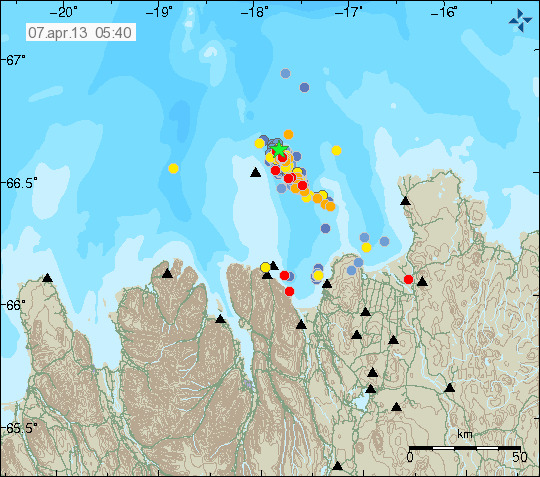 Tjörnes Fracture Zone (North of Iceland): The powerful earthquake swarm that started a week ago continues, but at reduced intensity compared to 2 April when the large magnitude 5.4 quake struck. Each day, hundreds of earthquakes have been occurring (more than 200 > magnitude 2 during the past 2 days). The earthquake swarm is the result of release of tectonic stress that has accumulated in the crust and is being released at the moment. The area is one of the main so-called transform zones,- regions where the separating Eurasian and North-American tectonic plates move sideways along strike-slip faults rather than spreading apart directly as is the case in the main rift zones, where also the main volcanoes are located, because the opening movment here allows large batches of magma to rise easily. The transform zones separate the rift zones at spreading plate boundaries at regular intervals in order to accommodate differential movements that are a result of the earth's curved surface where rigid plates move apart. In the transform zones, the sideways movement can produce much more strain in the rocks and has therefore the potential of larger earthquakes. Recent GPS and seismic studies of the TFZ suggest that the plates at depth have been "locked" for a while and accumulated large stress, which is why the recent and present earthquake swarms are no a surprise. It seems that this stress has started to be released right now. However, the possibility of a larger earthquake (up to magnitude 7) remains in place. Bagana (Bougainville Island, Papua New Guinea): A stronger eruptive phase has been occurring since last night. Several ash plumes reaching 10,000 ft (3 km) altitude have been observed drifting 45 nautical miles to the WSW (VAAC Darwin). Batu Tara (Sunda Islands, Indonesia): Explosions continue with sometimes stronger ones that send ash to 7,000 ft (2.1 km) altitude on a daily basis now. Paluweh (off Flores Island, Indonesia): Frequent ash emissions are being reported by VAAC Darwin. Today, ash plumes rose to 10,000 ft (3 km) altitude and drifted 45 nautical miles to the WSW. Galeras (Colombia): Ash emissions have become more frequent since 4 April - the Pasto observatory has reported daily small explosions since then. This marks a significant increase in activity. Before, the volcano had produced such emissions only a few times per month since September 2012. No corresponding increase in seismic activity was reported and the (official) alert level remains at yellow (corresponding to "orange"="minor activity" on the scale we use). Sabancaya (Peru): Seismic activity has decreased at the volcano, the latest press release of IGP shows. 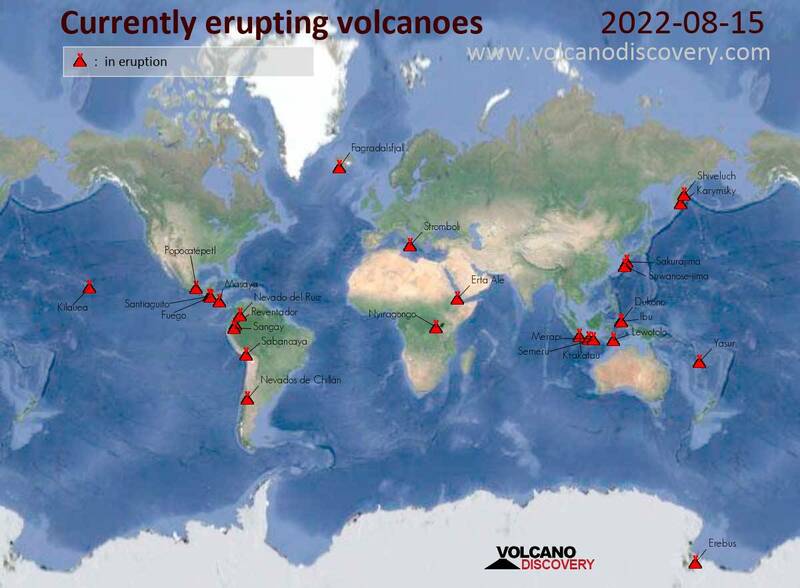 It seems less likely now that the volcano will produce an eruption soon,- as in many cases, an intrusion has happened at depth without (so far) breaching the surface (= erupting).